A RESIDENT has branded Bristol City Council’s decision to install a charging point for electric vehicles at the edge of Eastville Park as an 'environmental horror story'. The authority has given the green light to its own proposals for a charging hub with spaces for eight vehicles, a transformer and an 8ft security fence, along with a snack kiosk, toilets and parking. The site is off Park Avenue, a cul-de-sac, and is next to the park's car park. People living nearby say the plans will destroy the ambience of the Victorian park and are dismayed at the felling of six trees and the destruction of a grassy knoll to make way for the scheme. They argue it makes a mockery of the council's 'green' pledges. Resident Pamela Nowicka said: "The project is an environmental horror story of the wanton destruction of our fragile green heritage and ecosystems. "The project goes against numerous elements of Bristol City Council's own core strategy in prioritising private car transport. "Electric cars are not 'green'. Their environmental footprint is larger than a conventional car, while additional electricity required will likely be produced by nuclear plants. The council wants to be seen as 'green' but this is simply greenwash. "The council recently passed a motion calling for zero carbon targets by 2025. Each tree that is going to be needlessly destroyed would absorb huge amounts of CO2." Another resident said they could not understand why the council needed to use part of the park when other areas would be more appropriate: "We were baffled as to why the proposed development was sited in the park, especially when there’s already another hub less than a mile away at Ikea." 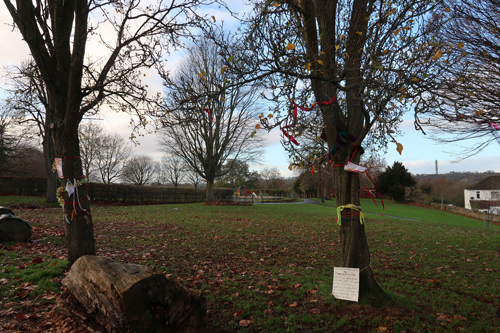 Residents created a make-shift shrine and decorated the threatened trees to draw attention to the plans. Despite receiving 19 objections and just six comments in favour, the authority's development control committee approved the plans at a meeting in December. A report to councillors said: "The public benefits promoted by this scheme in terms of the promotion of electric cars is a positive element of the proposal which will assist in the council aim for a carbon neutral city. The facilities that are part of the proposal (kiosk and toilets) will promote and improve the day to day experience of users to the park. Weighted against the harm caused to this less sensitive area of the historic park officers consider that the public benefits outweigh the slight harm caused." The report also played down residents' fears the development would lead to traffic chaos: "A number of local residents have raised concerns that the site will turn into a 'service station' and result in a significant volume of traffic utilising the car park. "Officers do not consider that this would happen as the uptake of electric vehicles in the city (and country) is low. At the point when electric cars are mainstream it is likely that there will be significant number of facilities available across the city and in residential areas meaning that the use of this facility would not be significant to result in a highway safety matter." The report also said 15 new trees would be planted and that bat and bird boxes and protection for badgers will be required as a condition.